Described by race organizers as one of the Pacific Northwest’s most stunningly beautiful and picturesque races, the Timberline Marathon & Half Marathons take runners on a tour around Timothy Lake near Mount Hood in the northwestern part of the state, along a challenging, high-elevation single-track trail run at 3,000 feet above sea level. Like the Deer Leap Half Marathon that takes place in the spring, the Timberline Half is actually longer than the usual 13.1-mile distance for a half — it has a 14.4-mile out-and-back loop course that starts and finishes just south of the lake, on Oregon Skyline Road. The course for the race is filled with slight changes in elevation as well as many twists and turns and bridges across creeks and tributaries. From there, runners follow the marked trail around Timothy Lake in a counter-clockwise direction — a change from the direction in which the race was run in previous years, which took participants clockwise around the lake — running past Hoodview and Pine Point around the southern edge of the lake, which are excellent viewing spots to see Mount Hood off in the distance. Once they pass over the dam on the lake’s southwestern side, runners then head north along the western edge of the blue, shimmering water along tree-lined single-track trails, often through forested areas. The trail takes runners full circle around the lake and then meets up once again with the section of the trail that leads back to the start/finish area on Oregon Skyline Road, where participants will be able to enjoy a massage from a licensed massage therapist after the race. Runners must be able to complete the race within the time limit of four hours, and each participant must bring his or her own hydration supplies — water or sports drink bottles — race organizers add, as aid stations will be available only along the second half of the race course. Runners thinking of signing up should be aware that each race will be limited to the first 400 entrants, so you’re encouraged to sign up early. Runners also need to be aware that insect repellent is a must, as bees, yellow jackets and other flying insects can be very active in the area at this time of year. 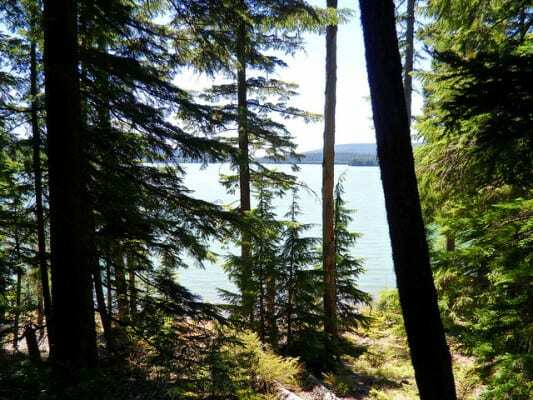 Located in northwestern Oregon, just over an hour’s drive east from Portland, Government Camp lies just a few miles north of Timothy Lake and typically experiences mild to cool (and occasionally cold) weather conditions in the opening weeks of the summer. On race day (June 15 & 16), the average low is 41ºF and the average high is 59ºF. See the race route map for the Timberline Half Marathon here. To reserve your spot in the 2019 running of Timothy Lake’s Timberline Marathon or Half Marathons, register online at RaceWire.com here. Ever run in the Timothy Lake Half Marathon? Share your impressions here, or post your review in the Comments below. We would like to update the Timberline Half Marathons with June 10 & 11, 2017 dates, new website and new registration service.